(Photo: REUTERS / Muhammad Hamed)Muslim pilgrims walk after the Friday prayers around Namirah mosque on the plains of Arafat during the annual haj pilgrimage, outside the holy city of Mecca,Saudi Arabia on October 3, 2014. The World Council of Churches' head has expressed sorrow and offered prayers after more than 700 people died in a human stampede near Mecca in Saudi Arabia which is taking flak over its arrangements for the annual Hajj pilgrimage. "I have just learned with shock and sorrow about the considerable and tragic loss of life among those participating in the Hajj due to the accident that has taken place today in Mina, near Mecca," said Rev. Olav Fykse Tveit, general secretary of the World Council of Churches. News agencies reported Sept. 24 that more than 717 people taking part in the Hajj pilgrimage have been killed in a stampede near the Islamic holy city of Mecca in Saudi Arabia at Mina. "My heart goes out to the relatives of those who have died, and to those who have been wounded. "I am saddened that people who are seeking to follow with loyalty and fidelity the tenets of their religion in this way should have suffered so grievously," said the WCC general secretary. "I offer my prayers for the wellbeing of the remaining pilgrims during the rest of their time in and near Mecca and then safe travel to their homes," Tveit said. Saudi King Salman said he had ordered a review of the kingdom's plans for the annual haj pilgrimage after the tragedy. King Salman spoke in a live speech broadcast by Saudi-owned al-Arabiya television and said he had asked for a swift investigation into what he described as a painful incident, Reuters news agency reported. At least 863 people were injured after two large groups of pilgrims arrived together at a crossroads in Mina, a few kilometers east of Mecca, on their way to performing the ritual known as "stoning of the devil" at Jamarat. It was the worst disaster to occur at the annual pilgrimage since July 1990, when 1,426 pilgrims suffocated in a tunnel near Mecca. Both incidents occurred on Eid al-Adha (Feast of the Sacrifice), Islam's most important feast. Most of the victims were Arabs and Africans, officials said and many of those injured were in semiconscious state, Arab News reported noting that the harsh summer weather added to the problem. Ayatollah Ali Khamenei, the supreme leader of Iran, which lost at least 95 of its citizens in the crush, said the Saudi government "must accept the huge responsibility for this catastrophe," the BCC reported. Khamenei said that "mismanagement and improper actions" were to blame. The Hajj is the fifth and final pillar of Islam said the BBC reported. It is the journey that every able-bodied adult Muslim must undertake at least once in their lives if they can afford it. 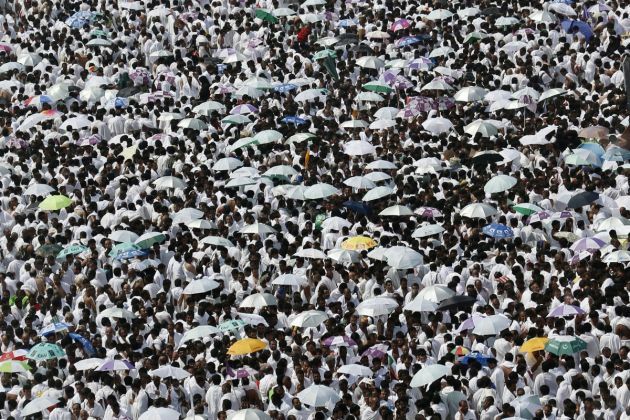 The number of people attending Hajj rose from 57,000 in 1921 to a high of 3.2 million three years ago, according to the Saudi Central Department of Statistics and Information.